What distinguishes Tennessee Williams from the other titans of his era (O'Neill and Miller) is his lyricism—the poetry that lifts his dramas from realism to a dreaminess that envelops our innermost longings and anxieties. To our great pleasure, we find as healthy a dose of these refined qualities in the three one-acts now in production at the Germinal Stage as we have found in the great dramas for which Williams is best known. The two first-act plays from the playwright's early work and the one second-act play from late in his career serve as telling bookends for a talent who, though maligned at the end by critics, nevertheless showed a steady gift for melodic and theatrical invention. Talk to Me Like the Rain and Let Me Listen … is both the title of and wistful refrain to the opening piece. The scene is a steamy and languid tiny studio apartment much like the setting in A Streetcar Named Desire, but The Man is contrite for his transgressions (no Stanley Kowalski here!) and The Woman a delicate flower, like Laura in The Glass Menagerie or Alma in The Eccentricities of the Nightingale. Director Ed Baierlein's pacing highlights the sensitivity expressed in the dialogue, with Trina Magness luxuriating in Williams' language and Tom Borrillo providing the minimalist rhythms that underpin a mood at the twilight of consciousness. 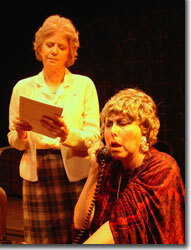 Williams' characterization, expressed through The Woman, of "two strangers living together" carries us into the second piece, Something Unspoken, where grande dame Cornelia lords over her longstanding live-in secretary, Grace. Strategically exploring the dynamics of this close acquaintance with the simple prop of a telephone, Williams focuses on Cornelia's need for social position and recognition as well as the emotional boundary between her and Grace that reflects the polarity of their circumstances. Amanda Wingfield and Blanche Dubois have nothing on Cornelia when it comes to delusional self-absorption and Sallie Diamond finds a treasure trove in the affectations that the playwright festooned upon this juicy character. Laura Booze is the right mix of temerity and conciliation in Grace, as the two wounded birds fend off the gray mediocrity of their lives, presaging themes from The Night of the Iguana. Finally, in I Can't Imagine Tomorrow, Williams revisits a Man and a Woman at the other end of their lives, measuring the dissipation of their faculties in ritual evening visits. Obviously former lovers and old friends, the two know each other as well as they know themselves. She puts up a brave front, barely able to hold off the debilitating pain that prevents her from climbing the stairs to her bedroom; he is insecure in his approach to her, yet unable to imagine tomorrow without her. Williams surprises us here with a loving fondness and emotional connection that belies the common view of his own state at the time. Lori Hansen's Woman embodies a compelling tension between physical pain and heartfelt understanding, while Baierlein's Man is a conundrum of half-realized thoughts and dire honesty. Together, the evening's three selections offer thoughtful insights on the development of Williams work while serving up exquisite examples of his linguistic gift. 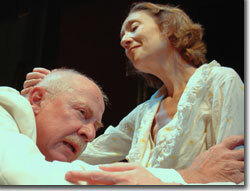 Germinal Stage Denver's production of Tennessee Williams in Three Keys runs through July 9th. 303-455-7108.